Follows the adventures of a crew of the deep-diving nuclear-powered civilian research submarine Hydronaut making a submerged circumnavigation of the world to plant monitoring sensors on the ocean floor that will help scientists better predict impending earthquakes. The crew of a five-man submarine travels the world oceans, planting sensors on the ocean floor to warn scientists of any impending earthquakes. Following the destruction of much of coastal Turkey by a massive tsunami, American scientists Dr. Doug Standish (a mugging Lloyd Bridges) and Dr. Craig Mosby (Brian Kelly playing kind of a sexist jerk) lead the crew of the submarine Hydronaut in a race to plant seismic sensors along fault lines on the ocean floor to create an experimental earthquake detection system in order to prevent other coastal countries from suffering the same fate. 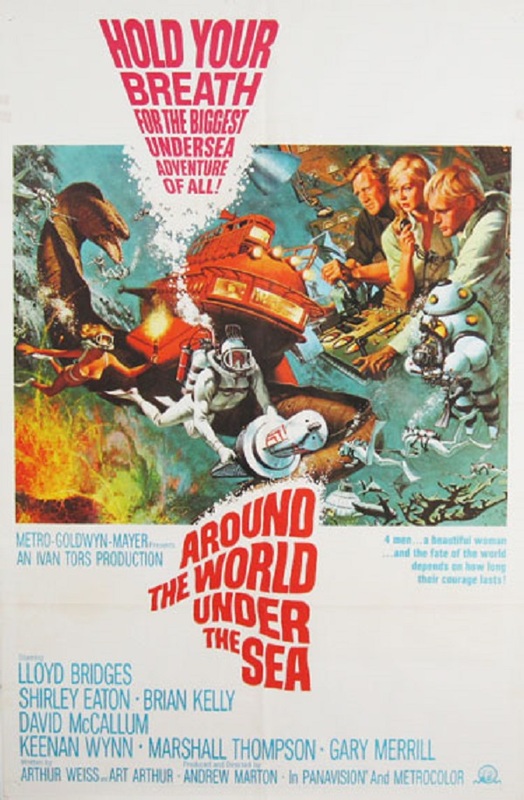 The crew consists of geologist Orin Hillyard (Marshall Thompson), electronics expert Dr. Philip Volker (David McCallum doing a hokey German accent) and marine biologist Margaret Hanford (the fetching Shirley Eaton as what basically amounts to eye candy). Also along for the ride is reclusive survival expert Hank Stahl (a delightfully curmudgeonly Keenan Wynn). While at times enjoyable, Around the World Under the Sea is, alas, a bit on the boring side. It isn't that badly written, not for a movie of its type, anyway, but in its apparent drive to depict the science fiction elements as realistically as possible (in a "this is totally plausible" sort of way), it tends to bog down. We spend far too much time focusing on the Hydronaut crew planting the various sensors that midway through the film a montage of them doing it gets the bulk of that out of the way to make way for... well, not undersea adventure, that's for sure. There is some of that, but it's few and far between and mostly, when the movie isn't methodically showing us in detail how they do various scientific tasks, it basically plays out like a soap opera set on a submarine: Volker wants to do a salvage dive for some valuable crystals but is opposed (for some reason the movie never bothers explaining) by Stahl, and the two have an epic chess game to decide whether they'll do it (Volker cheats! ); Hanford is ostensibly Hillyard's girlfriend at the start, but starts falling for Mosby despite him being kind of a sexist pig, and on top of this she's Volker's ex and there is unresolved tension between them. The movie seems to think that this is all more interesting than giant eels and erupting undersea volcanoes. It would be wrong. One thing of note is the sexism against Dr. Hanford that Craig Mosby has, and, to some extent, so does the movie. With comments like "she's as good with a skillet as she is with a scalpel," it at times feels like a movie from a much earlier film, far less tolerant of women in the workplace. When Hanford is late for the Hydronaut's takeoff, the chief concern regarding her is that they can't set sail without a cook (!). If nothing else, at least the poor woman gets support from Standish if no one else, who points out "She's a scientist and so are we" and doesn't find the idea of female astronauts at all unusual, and hires her on the spot even once he learns the mysterious and overqualified "M.E. Hanford" is a woman, whilst it is Mosby who objects to having a woman aboard the sub. Still, most of it just seems like lip service, as, despite Standish's insistence in her abilities, all supposed marine biologist Hanford ever really does is "woman" stuff like serving coffee while Stahl (who isn't even a scientist) does most of the specimen collecting and lab work. This nonsense aside, it has its moments. There's a close call where Hillyard is burned by an undersea vent and has to be rescued by Volker, as well as a giant moray eel which attacks the sub, and a fairly satisfying climax involving a giant underwater volcano and a rock slide which buries the sub, trapping our heroes and forcing them to use their quick wits to escape. Recommended for viewers with lots and lots of patience. For a far better and more enjoyable undersea adventure flick, see either 20,000 Leagues Under the Sea or Voyage to the Bottom of the Sea. All those reviewers who disliked this film are largely correct: this film is largely geared toward boys, it's unrealistic, the science isn't sound, the acting might be considered weak, some effects are weak, and so on. But I still love it. So what are all those reviewers missing? Films like this offer a visionary ideal for living, especially in this modern age where some people really believe that hedonism and materialism are the ultimate good, and that intellectualism and science are to be ridiculed and avoided since being "cool" is antithetical to intellectualism. The film also has some decent humor, and a nice, realistic mix of sexism and promotion of women's equality. There are numerous other likable things in this film. The underwater scenery is beautiful, Shirley Eaton is beautiful, the equipment is cool, the inclusion of a chess game is terrific, the capturing of the daily submarine routine (planting sensors, playing chess) is great, and the constant presence of science provides an intellectual atmosphere. Also, each the characters is likable in his/her own way. I especially liked Hank Stahl, whose mature insights into the ugly side of human nature are standard nowadays, and he is about the only character who is not foolishly chasing after Maggie the entire time. Also, although I'll admit it's puerile, I loved the guinea pigs, even though they were probably included just for humor and for young viewers. I even bought some guinea pigs as pets for the first time in my life as a result of re-watching this film as an adult! There are a number of coincidences throughout that were probably accidental, but are either charming or humorous, depending on your taste in '60s movies and television: (1) a brief, repetitious, 2-note, Jaws-like musical theme in one underwater scene of the Hydronaut; (2) an UNCLE communicator-like 2-tone beeping from an alarm that goes off while David McCallum (Illya!) is in the scene; (3) a spherical sub streaming yellow dye, reminiscent of James Bond in the final underwater fight sequence in "Thunderball"; (4) a helicopter rescue of floating survivors at the end, reminiscent of the rescues at the end of "Thunderball" and "You Only Live Twice"; (5) entering into a briefing room where a monotone-voiced narrator is speaking, reminiscent of Number 1's briefing in "Thunderball." Some other delights for '60s fans are: (1) footage of the J. Neville McArthur Engineering Building at the University of Miami, with its charming, white waves facade; (2) Lloyd Bridges incessantly leaping into the water to try to be a hero at every opportunity, usually without enough air or without proper equipment, "Sea Hunt" style. The chess match alone deserves some comment. You could view the inclusion of chess in the film only as an appeal to young adolescent males, but then you would be overlooking the Conshelf II underwater habitat of 1966 as depicted in National Geographic magazine, which had one well-known photo of two men playing chess next to a porthole with fish swimming outside. That photo, in turn, probably inspired the scene from the EPCOT ride Horizons that had two men playing chess beside a porthole in a futuristic underwater habitat. And that's not to mention the HAL-Bowman chess game aboard the spaceship Discovery One in the film "2001: A Space Odyssey" (1968). There is something about chess that is a good match with futuristic living quarters. Maybe it's the heavy intellectual component in both the game and the design of any such habitat, or maybe it's the contrast of ancient with futuristic (or should we say "hypermodern"?). Also, inclusion of the computer chess program in the film was an interesting, realistic, and historically significant. Even today online chess players on Yahoo often get caught cheating when they resort to their home chess computers for suggested moves, which is against the rules, so that twist in the plot was ahead of its time. Also, it wasn't until the 1980s that chess programs became strong enough that they could reliably beat most human players, therefore when Hank Stahl won the chess match even when Dr. Volker used a computer against him, that was realistic and ahead of its time. The late '60s, despite its problems, was beginning to approach an ideal that was captured extremely well in this film. Everything from the pervasive white color of equipment (such as in the sub interior, ships, and helicopters) that gave a sense of cleanliness, to the orchestral score, to the constant scientific background (which was also prevalent throughout Disneyland in that era), to a simultaneous acknowledgment of women's strengths and weaknesses, gave a sense of progress, community, and balance of the physical, emotional, and intellectual. It shows us a paragon of human society that is realistically achievable. Acting skill or realism of the non-decompression scenes is irrelevant to this bigger vision.